As I work with a buyer to help them find the best home for them, I try to help them look at the big picture and long-term ramifications of their purchase. Statistics show that families move every 5 years or so and so I try to help my clients look at their home’s value if/when they decide to sell it. I hope that all my clients become clients for life and that I will be the agent helping them sell their home when that time comes. I was looking in a certain community in Northwest Austin with a client of mine and we were looking at both new construction and resale homes. With the ever increasing demand in Austin, builders can repeatedly raise the prices on their homes because the limited supply of resale homes means that buyers have few options but to purchase a new home. That imbalance can drive a buyer to pay more for a new home that it is really worth. Unless homes appreciate at a much higher rate than historical averages, they will unlikely be able to sell it in the future without selling it for less than they owe on their mortgage (a short sale). For example, in the neighborhood we were looking in, new homes were selling on average for over 15% ($51,000) more than resale homes and 13% ($14) more per square foot. Also noteworthy is that resale homes sold 98% of list price while new homes sold for 96% of list price. That would indicated that you can often get a more significant concession from a builder than you can from a home owner who is selling their primary residence. There is a certain dynamic in communities where resale homes are being sold alongside new homes that builders are building brand new – new homes effectively set a “price ceiling” on all homes available for purchase. To illustrate – if a buyer is considering two very similar homes, one is resale and one is new construction, they will almost assuredly be willing to pay a premium for the home that no one has lived in previously. That premium puts a cap on what a homeowner can sell their home for in the same neighborhood. What does this mean for a buyer who is considering a new home versus a resale home? In our example neighborhood, the new home premium can be as high as $51,000. The average price per square foot for resale homes is $105 with new homes selling for $118 and some now being priced as high as $150! While we can’t exactly forecast what prices will be in 5 years, if the new home premium remains that same, the neighborhood would have to appreciate 15% over that time for our buyer to be able to sell the home for the same price he paid for it. 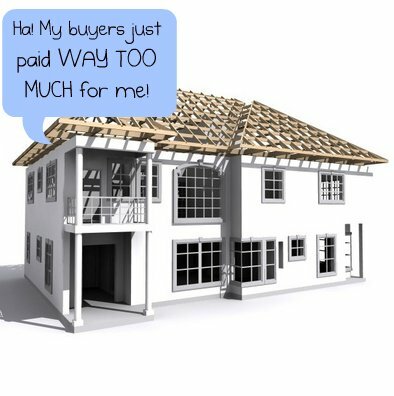 I would hate to come back to my client when he is asking me to sell the home I helped him purchase 5 years ago and tell him that his home is worth less than what he paid. What I am NOT saying, it that new homes will automatically lose value when you purchase them (like buying a new car) or that your new home is not worth what you just paid for it. What I AM saying is that you should be aware of the dynamic I described in neighborhoods where there are new homes and resale homes being sold side by side and make sure that your REALTOR is helping you properly evaluate the true value of any home you are potentially purchasing. Also, understand that values can be very different in different neighborhoods and this dynamic can be different in each. If you have questions about any certain neighborhoods or have questions about buying a home, new construction or resale, drop me a note and I would be happy to help however I can.